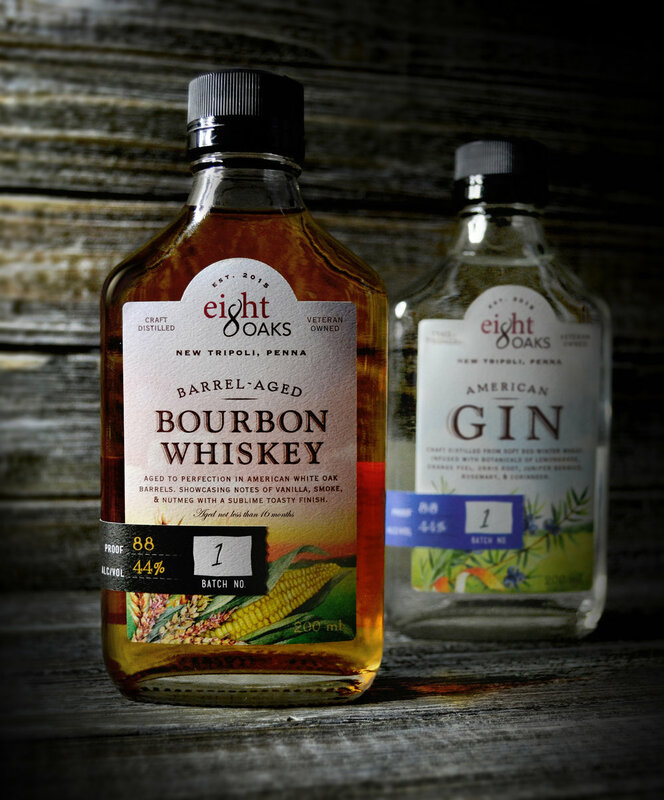 Eight Oaks is a veteran-owned craft distillery located in New Tripoli, Pennsylvania. We concluded our first package design project for the Eight Oaks limited release Ocho Robles Agave Spirit in June of 2018. While the Blue Weber Agave used to create Ocho Robles is sourced from Mexico, the spirit is distilled and bottled at Eight Oaks in PA, and is therefore barred from the “tequila” title. Nevertheless, Ocho Robles shines on shelf and is a staunch contender to any tequila brand. Both the spirit and the label design are an adventurous departure from the existing Eight Oaks portfolio of products, showcasing splashes of color through watercolor agave, landscape illustrations, and ornate Mexican-inspired typography. "Eight Oaks is a veteran-owned craft distillery located in the rolling farmlands of the Lehigh Valley. We proudly grow our grains right here on our farm, just steps from the distillery. For other fresh, sustainably grown ingredients, we look to our neighbors — local farmers and trusted friends who provide us with nothing but the very best. By keeping things close to home, we control every step of the process. The result? Unique seed-to-bottle spirits with Pennsylvania roots that run deep." "Ocho Robles (Spanish for “Eight Oaks”) is our version of everyone’s favorite agave spirit. Blue Weber Agave nectar arrived at our distillery from south of the border, packed with 100% pure goodness. We cooked our agave mash, then fermented and distilled it into a silky smooth spirit that won’t stay bottled for long. Earthy, floral, and spicy, you’ll be shouting “¡Aye Dios Mio!” with every sip. So grab a shot glass or a margarita glass, and savor the spirit of agave." Eight Oaks Distillers 2018 gift pack and 200ml bottle designs for Gin, Vodka, Bourbon Whiskey, and PA Rye Whiskey. This design refresh served as the foundation for all Eight Oaks spirit redesigns—existing and new product introductions—including 375ml and 750ml SKUs.